What is Hebrews 10:25 pointing us to look at concerning Jesus' soon return? Hebrews 10:25 says, "Let us not give up meeting together, as some are in the habit of doing, but let us encourage one another—and all the more as you see the Day approaching." That verse makes it clear that there are signs that we are to watch out for that will identify the season of the return of Jesus Christ. I've asked my old friend and Bible prophecy expert Gary Fisher of Lion of Judah Ministry if he believes that the signs of the times indicate that the season of the Lord's return is upon us. Dr. Reagan: Gary, how about sharing from your heart for a minute about your favorite verse — Hebrews 10:25. Gary Fisher: In Hebrews 10:25 it says, "Encourage each other in so much the more as we see the day approaching." We take it in our ministry that there are important events coming from that verse that point out to us that the coming of the Lord is near. What are those things that we can see? One of the things that Jesus talked about was in Matthew 24:7 concerning the increase of earthquakes. Jesus said that those earthquakes would increase like birth pains upon a woman. Now, I get this question frequently coming in to my ministry and all of the places where I do conferences, but people ask, "Can those frequencies and intensities be verified?" I point those folks to the U.S. Geological Surveys website. I printed out for the year 2000 the total number of earthquakes, and they measured 22,256. For the year 2008 there was a great increase to 31,777. I think anybody can easily see from those earthquake statistics that they are indeed on the increase. Let's talk about wars for a moment. The Bible also says that wars would increase in frequency birth labor pains upon a woman. Can that also be verified in history? Yes, the Twentieth Century lost more lives to war than all of the other centuries combined. I would say that wars are definitely on the increase. Of just three things that are called for in Scripture that preface the coming of Jesus, let's discuss the third — the development of super powers. Russia is one of those super powers that is mentioned in Ezekiel 38. Iran is another one of those that is mentioned in Ezekiel 38:5. Can we see those develop today? Of course! C. I. Scofield mentioned in 1908 in his first study Bible he published that he didn't understand that there was going to be Russia coming against Israel in the last days. And yet, we see that developing. Iran is mentioned in verse 5 as going to be one of Russia's allies. How in the world could C.I. Scofield have know that back in 1908? Well, because Bible prophecy declared it in advance. Today unlike in 1908 Russia is a nation that is ready, biting at the bit to go into the Middle East and get involved. We see Iran involved with them as an ally. The development of super powers includes Russia being one of those, and China is another one. We see in Revelation there is going to be an army from the East coming of at least 200 million. Revelation recorded that in 95 AD! How could John have understood in 95 AD that an army of 200 million could be possible? Today China has something like two billion people, and filling an army of 200 million would be no problem at all for them. Another super power that is very, very seriously coming up on scene is the European Union. Daniel 2:7 says that in the last days the Roman Empire would come back together again and be in place when Jesus set His foot back on this planet. We see the European Union coming back together today, reviving that old Roman Empire. It is a modern day sign that Jesus is coming soon. What other signs can we see visibly on the earth that note that Jesus is coming soon? Jesus talked about a church in Revelation 3:14-20. That Church would be called the Laodicean Church. Laodicea in Greek means "people ruling." That is exactly the church we see today! If nobody is happy in their church, well they just go home and don't support it anymore. We see Revelation 3 where the Laodicean Church have people with their shoulders shrugged and are saying, "So what?" They're showing they are apathetic and they're indifferent, and that is exactly the Church that we see out there. Second Timothy 4 talks about that Church and it says that church would not endure sound doctrine. The Church we see today has given up on sound doctrines. They are mostly given over to myths, legends and the tickling of their ears. Everybody sadly is witness to this by watching the Church today. 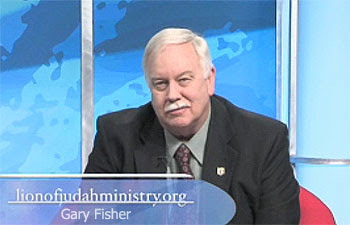 In the next part of my interview with Gary Fisher concerning Hebrews 10:25, Gary will give us some more signs of the times that point to the Lord's soon return. EI had mentioned a few days ago about my wife going to the hospital. My wife started bloating up from diabetes, kidney & heart conditions and we took her to the hospital on the 28th. Every other day they tell us maybe she can come home in a day or 2 if her numbers come back to an acceptable range... whatever that means. So we wait another day. We appreciate all of your prayers. Thanks for the update, DrNoFog! We here at Lamb & Lion will be praying for her that she'll stabilize and be home really soon. Praying for healing, Doc. May your wife go home speedily. My prayers r with u, dr nofog, and for ur wife's speedy recovery. Considering the signs in the church. The following link was filmed five months ago in July, but it is news to me. I am amazed at how audacious the enemy has become in his schemes. The Harlot church has cast aside her veil and she is standing on the street corner brazenly plying her trade. The False Prophet, and one of his priests, Rick Warren, is preparing the ground for the worship of the Beast; and the Abomination that makes desolate, as spoken by the prophet Daniel, is undoubtedly on the blueprints for the pending Tribulation Temple.